Kelsee Angell is a hearing-level case manager at Nyman Turkish PC. She enjoys working at Nyman Turkish because of her wonderful coworkers and the fulfilling work of helping those who are in need. Before joining the Nyman Turkish team, Kelsee worked in the Labor and Delivery Department at The University of Michigan Hospital. 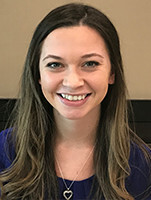 Kelsee will graduate in December 2018 from Eastern Michigan University with a Major in Paralegal Studies, and she plans to continue on to law school. Outside of work, she enjoys travelling, concerts, and music festivals.